Creating a consistent exercise routine does wonders for our health, but it can be difficult to stay inspired before and during the workout. Let’s face it, the act of working out itself is usually not enjoyable. We do it primarily for the outcome and future health benefits, but it can be difficult to overcome the fatigue and pain of the actual exercises. That’s why the majority of people look for ways to take their minds off the actual work, normally by listening to music. Music not only presents a diversion but also brings about the determination and stimulation required to maximize effort. You might not feel like going to the gym today, but put on your favorite music and suddenly you’re charged and ready to go. This is where hearing aids can be valuable for individuals with hearing loss. With compatible hearing aids, you can stream your favorite music directly from your music player or smartphone to your hearing aids—without any wires getting in the way. As an alternative, if you’re in the learning state of mind, you can also stream your favorite podcasts or online courses, strengthening both your mental and physical health at the same time. Have a fitness partner instead? The latest hearing aid models, furnished with directional microphones, target and enhance speech while curbing background noise, making it easier to hold a discussion with your partner in an active gym. 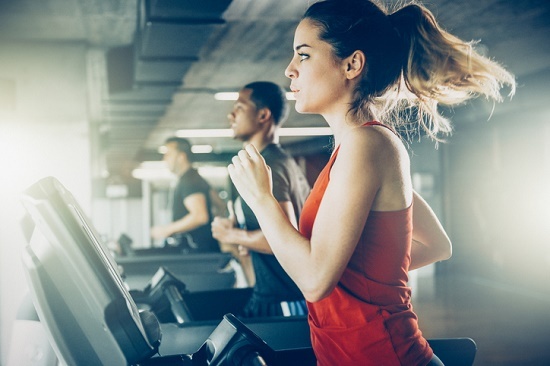 For all these reasons hearing aids are worthwhile gym equipment, but you may be wary of potential damage to the device from sweat and moisture. While the majority of hearing aid models are resistant to dust and wetness to some extent, there are a few accessories you can use to protect your hearing aids at the gym. Hearing aid sweatbands – these absorbent sleeves fit over your hearing aids, guarding them from sweat and grime. Hearing aid clips – helps to prevent damage or loss if your hearing aids become unintentionally dislodged from your ears. Batteries – maintaining an extra pair on hand ensures you won’t run out of power mid-workout. Cleaning kits – helps clean and sanitize your hearing aids after your workout. Hearing aid dehumidifier – well worth investing in for three reasons: dehumidifiers 1) eliminate moisture, 2) sanitize using UV light, and 3) provide a safe place for overnight storage. With a little planning, you can safely enjoy all the benefits of hearing aids at the gym. If you have any questions, or want to find out more about hearing aid accessories for the gym, send us a message or give us a call!